Make plans to join us for our FIRST Valentines Day Social! The Anson County Chamber of Commerce is looking for your talented young professionals! Dedicated to the promotion and encouragement of young professionals in the workplace, YP Anson is looking for a group in their 20’s and 30’s that have a strong educational background, a dedicated work ethic, and a desire for career development. 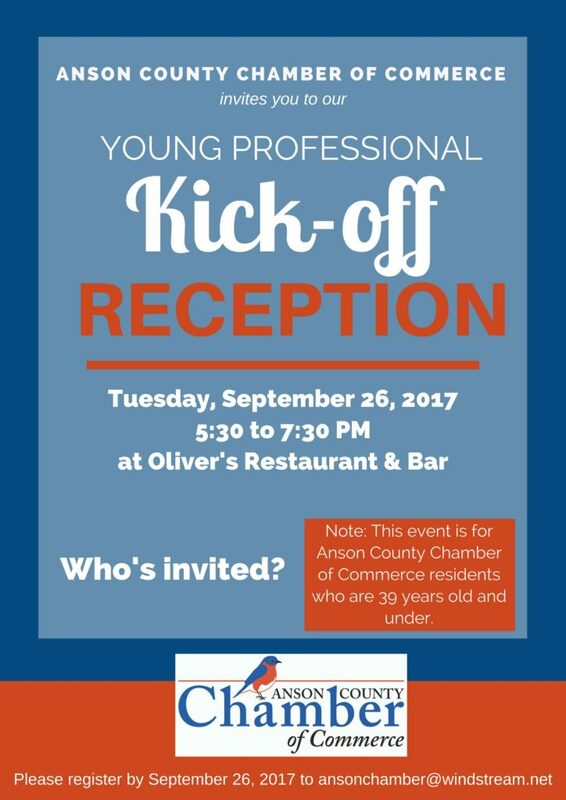 We will be kicking off with a fantastic networking session at Oliver’s Restaurant and Bar on Tuesday, September 26th from 5:30 – 7:30 p.m. hors-d’oeuvres and beverages will be provided by the Anson County Chamber of Commerce and all Anson County young professionals are invited to attend. 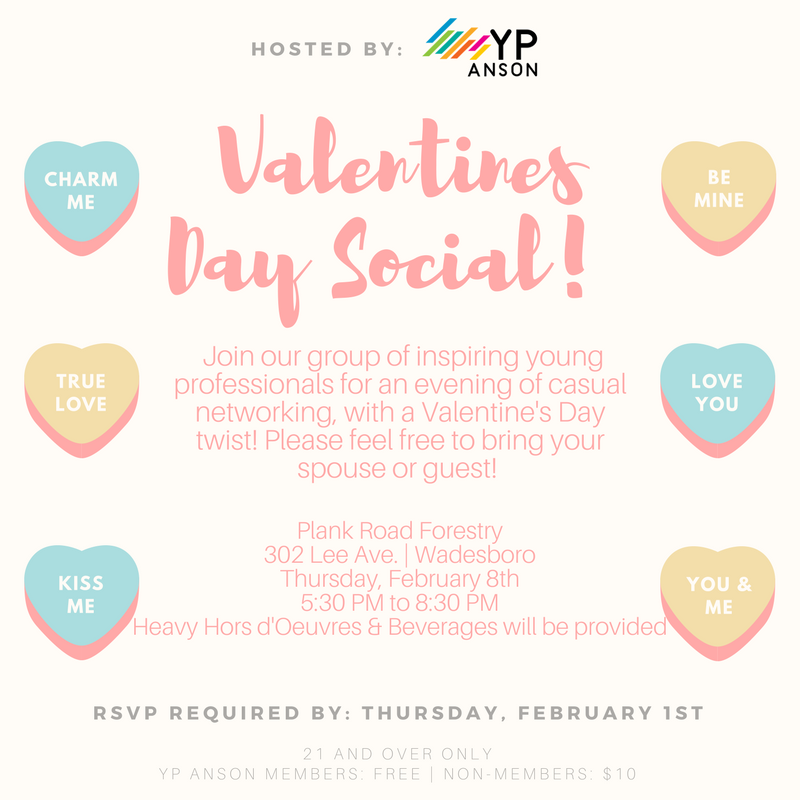 Through networking events, community service projects, and educational programs, YP Anson is striving to be the premier young professional organization in Anson County. This year we are excited about making a difference in our community! We need your young professionals to continue growing our membership in order to create an even greater impact. 1. Networking Opportunities with Other Young Professionals – Socials, kickball tournaments, etc. 2. Involvement with Anson County Economic Development Initiatives – An opportunity for members to work with county officials on issues related to growth and development. 3. Volunteering and Mentoring Opportunities – Members will have an opportunity to volunteer their time and talents and get involved with organizations around the community. 4. Education Opportunities – Members will be invited to educational seminars on various topics relevant to young professionals, such as leadership, workplace initiatives, the proper use of social media, etc. To register, please contact Megan Sellers at 704-694-4181 or ansonchamber@windstream.net at the Anson County Chamber or visit www.ansoncountychamber.org. Please let me know if you have any questions or concerns. We look forward to seeing your young professionals on September 26th!